Sports Chatter with MJD – Page 2 – I'm a sports nerd and I love to write about them. Boston sports, NFL, NBA, College sports, PGA Tour. Whatever it is, I've probably written about it. The NFL season is a little more than a month away. Many fantasy football drafts will be taking place in the next month, which means it’s time to start thinking about what sleepers to snag in the later rounds and which busts to avoid in the earlier rounds. I’m going to give one bust and one sleeper in each AFC division to help you get thinking about your upcoming draft. Hopefully members of my own fantasy leagues don’t read this, so they’re unable to gain the competitive edge. The Dolphins traded Jarvis Laundry this past off-season. Laundry was 4th in the NFL with 160 targets. Someone will have to absorb some of those targets. While the Dolphins brought in Albert Wilson from the Chiefs to help replace Laundry, I still think Kenny Stills will be the WR to own in Miami this year. Devante Parker has proved time and time again that he can’t stay healthy. Meanwhile, Stills showed some chemistry with Ryan Tannehill a few years ago in his 2nd season with the Dolphins. Another year with Tannehill, combined with the fact that the Dolphins will need someone to step up as their number one wideout, could mean a big year is in store for Stills. This one hurts to write as a Patriots fans, but I’m not one to be biased. Edelman is a 32 year old WR headed into his 10th NFL season (kind of crazy to think he’s played for that long), coming off a torn ACL, and will be serving a 4 game suspension to start the season for using PEDs. Not only do you have to worry about a drop-off with his age, but you also have to worry about his PED bust impacting his play on the field. I’d much rather take Chris Hogan who is going at the beginning of the 6th round in many drafts compared to Julian who’s going in the mid-to late 7th round. James Washington will be going into his rookie year for the Steelers. Washington won the award for the best WR in College Football last year… the man can play. His combine left a little to be desired but if the Steelers have proved anything over the last several years, they know how to draft wideouts. How about the list of the guys they’ve taken… Antonio Brown, Mike Wallace, Emmanuel Sanders, Martavis Bryant, and Ju-Ju Smith Schuster. None of these aforementioned players were 1st round picks… and the same is true of Washington. If there’s a significant injury to Antonio Brown, Ju-Ju… or even Lev Bell, be ready to pounce on Washington on waivers…and I don’t mind taking a stab on him late in drafts as well. There’s no denying that Alex Collins had a very strong 2nd half of the season last year. The Ravens didn’t bring in any major backfield free agents or draft picks to compete with him for snaps this upcoming season. He’s backed up by Buck Allen and Kenneth Dixon. The red flags for me with Collins are his fumbling issues, shortcomings as a pass catcher, and the fact he’s always been replacement level talent until this past season. Collins had 4 fumbles in 16 games last year. That won’t fly again in 2018. He’s also not a strong pass catcher. In the end Collins stats are a little inflated by his first 3 games last year when he averaged 6 YPC, 9 YPC, and 9 YPC, as a rotational RB. Take those 3 games out and he only averaged over 4 YPC in 5 of his last 13 games. He’s never been the most explosive guy, going back to his days at Arkansas and I expect someone else (whether on the team or via FA/Trade) to be the most valuable Ravens RB by season end. Patrick Mahomes is without question my favorite sleeper at QB. Alex Smith had led the Chiefs to the playoffs in 4 of his 5 seasons with the franchise… yet the team couldn’t had been more ready to move on from him. It’s all because of the potential greatness they see out of Mahomes. When I hear Louis Riddick (a man I consider to be the best NFL Analyst at ESPN) say of Mahomes, “I think he’s going to absolutely set the league on fire next year. I think Andy Reid is on to something down there in Kansas City”, I put a lot of stock into it. Mahomes has the arm, the swagger, the confidence of his franchise and weapons in Tyreek Hill, Sammi Watkins, Travis Kelce, and Kareem Hunt, to have a big year in KC and be a top 5 Fantasy QB. Mahomes is currently going around the 10th round. Every year in fantasy, there are a few backfields that are an absolute mess for fantasy owners. The Denver Broncos are headed in that direction. Right now Devontae Booker, Royce Freeman, De’Angelo Henderson, and Phillip Lindsay have all received first-team reps. Of course there’s glowing reports about each guy from beat writers around Denver. While 2 or 3 of them will probably pull away from the pack as the backs to draft/own, I have a feeling it will be tough to gauge which guy to start on a week-to-week basis. On top of that Denver had one of the worst offensive lines in the NFL least year. While they did add veteran LT Jared Veldheer to help stabilize their issues, how the unit will mesh is still a major question mark heading into the season. 3rd round rookie RB Royce Freeman is currently going around the mid 5th round in many drafts. I would definitely let someone else grab him and take a stab on Booker in the 11th or Henderson who goes undrafted, if drafting any of them. This is a risky prediction because there’s still an outside chance he could start the year on PUP due to his torn Achilles back in Week 11 of last year. If Foreman comes back healthy, I think he will take over the starting RB position from a mediocre Lamar Miller. Foreman was pushing Miller for touches before his season-ending injury last year. Miller is coming off a down season in which he averaged only 3.6 YPC. Anyone who watched the Texans last year saw that Foreman looked like the much more explosive player. Let’s not forget the Texans drafted Foreman in the 3rd round just 2 years ago as well. They clearly believe in his talent… as do I. I expect his average draft position which is around the 10th round to drop a little since he hasn’t taken the practice field yet. I for one will be targeting him in drafts. Let me preface this by saying Dion Lewis was one of my favorite Patriots over the last few seasons. I think he can still be a very valuable member of the Titans offense, but he has never been the most durable RB. He’s currently going around the 6th round in drafts, which is far too early in my eyes. Lewis was used as a bellcow by the Pats towards the end of last season. While he did a phenomenal job, I’m worried that it may catch up to him this season and injuries may occur again. I am also a huge believer in Derrick Henry and I think it’ll be difficult for the Titans to keep him off the field. Be on the lookout for my NFC sleepers and busts preview in the next few weeks! LeBron James to the Celtics? Could it happen? Do Celtics fans want The King? I’ve said it before in past blogs and I constantly talk about it among my peers, LeBron James is the most tantalizing athlete of my generation. People either love him or hate him. People criticize him for how he wins, how he loses, biting his finger nails, and at every available opportunity. After all, who can blame these guys, who wouldn’t want LBJ? He’s still the best player in the world, best player of our generation, and better than Michael Jordan in some people’s opinions. Boston sports media began buzzing last Wednesday when Stephen A. Smith of ESPN and a highly plugged in NBA personality, went on air and said LeBron will talk with the Boston Celtics this off-season regarding his free agency. Now let’s set the record straight, the odds of LeBron coming to Boston right now are not very likely. Most sports books have the Celtics anywhere from 10-1 to 20-1. The Lakers are the favorite at this point to sign The King. The Celtics would have to jump through many hoops (no pun intended) to be able to sign him. First and most importantly is the relationship Bron’ and Kyrie Irving have. Many people think Kyrie requested a trade out of Cleveland to get out of LeBron’s shadow. People believed that their marriage had taken a toll on each other. Other people, close to the situation, have said their relationship was not as bad as people think, and that Kyrie instead was sick of the Cavs organization. For arguments sake, lets assume that Kyrie wanted out of Cleveland because he was sick of playing with LBJ. You’d have to believe that if LeBron came to Boston, that Kyrie would have to go… and at the very least Gordon Hayward and others, like Marcus Morris, would have to go in order to make the salary cap work. Would sacrificing the 25 year old Kyrie Irving via trade for a 33 year old LeBron James be worth it? For me, it comes down to what a Kyrie trade could net you. If Kyrie could land you a guy like a Karl-Anthony Towns (22 years old), Damian Lillard (27 years old) or Kawhi Leonard (26 years old) then as much as it pains me to say it, I would give up Kyrie and bring LeBron on board. But if you have to give up Hayward to the Cavs in a sign and trade for LeBron (to make the salaries work for the Celtics), and then trade Kyrie because he doesn’t want to play with LeBron again and only get a kings ransom of draft picks, then as much as I love LeBron, I would have to be out on trying to sign him. I have plenty of friends who dislike LeBron and are always eager to chirp me when he has a bad game or loses in the NBA Finals. I love when they come at me saying “Michael Jordan would never get swept in the NBA Finals!” Some of them are already on record saying they wouldn’t want the Celtics to sign him because they don’t want to root for him. I even put a poll up on Instagram today asking if Celtics fans would want him. Out of 70 votes, 69% of voters said they wouldn’t want him, while 31% said they would be in favor of LeBron coming to the Celts. For me if all things were equal… of course I would want the privilege of being able to consistently watch one of the best NBA Players we’ve ever seen night in and night out. The idea of being able to go watch him play in person at the TD Garden, a handful of times throughout the year, is very exciting. As much as I want him to sign with the Celtics because of how great I think he is and how amazing I think the buzz around Boston would be with him coming here, I also just want him here to laugh in my friends and Celtics fans faces come next spring, when he would lead us to a guaranteed NBA Finals appearance and possible championship over the Warriors. I am sure that at that point all the “haters” would be bowing down to LeBron talking about how great he is and pulling a 180 saying how smart Danny Ainge was to get him here. The last point I want to touch on is why it makes sense for LeBron to want to play for Boston. If he’s still concerned with winning championships, improving his legacy, and taking down the Warriors, who have beat him in 3 of the last 4 NBA Finals, then for pure basketball reasons Boston makes the most sense for him to win. Jalen Rose of ESPN and former NBA Player went on record Monday morning saying “LeBron can only win a title with the Celtics or Warriors next year.” I’m not going to even consider the second half of his statement in regards to the Warriors… but coming to the Celtics makes all the sense in the world. He gets to play with 2 young guns that took the NBA by storm in the postseason, Jaylen Brown and Jayson Tatum. Both have young fresh legs and can help take the burden off him defensively and offensively during the regular season. He also gets to play with some kind of mix of Kyrie Irving, Gordon Hayward, Al Horford, or Kawhi Leonard/Karl-Anthony Towns. All of the aforementioned guys have proven their worth in the league as a mix of All-Stars, All NBA Players, and All NBA Defensive players. If LeBron is more concerned with starting to settle down in his career and play in nice weather while continuing to grow his brand, then somewhere like LA or Miami may make more sense, but he won’t be winning any rings there compared to the chances he would have with Boston over the next few seasons. Buckle up Celtics fans and NBA fans because the next month or so in the NBA is going to be wild as the draft and #WhereWillLeBronGo story-lines begin to unfold. Author sportschattermjdPosted on June 13, 2018 Tags Lebron JamesLeave a comment on LeBron James to the Celtics? Could it happen? Do Celtics fans want The King? What a Celtics season it’s been. Everyone left them for dead after Gordon Hayward went down in the first few minutes of their season opener. Pessimism set in again after Kyrie went down with his season ending knee injury back in April. Now here we are in Mid-May and the Celts are getting ready to host the Cleveland Cavaliers and LeBron James in game one of the Eastern Conference Finals. A year after getting waxed by the Cavs in the 2017 Eastern Conference Finals, the Celtics feel better equipped to try and dethrone LeBron. Cleveland has since lost Kyrie (boy do I wish he was playing in this series) and the Celtics are more athletic such that from a defensive perspective, they can throw multiple different players at LeBron. They are also a better defensive unit as a team. Like any 7 game series in the NBA, there are a number of factors that will decide this one…. – Do you sell-out to stop (or try and contain) LeBron and make his secondary options beat you… or do you let LeBron get his points and make sure the secondary guys (e.g. Love, JR, Korver) don’t get hot? – Can Brad Stevens dominate the coaching matchup as the best coach in the NBA and expose Ty Lue as the mediocre coach a lot of people think he is? We watched Brad thoroughly out-coach Brett Brown last series. One would have to think his leadership and basketball intelligence could be a major reason the Celtics may win this series. – Will the Celtics ability to throw different bodies consistently at LeBron cause him some issues? I think we could see up to 6 different guys cover LeBron this series. I bet that Jaylen, Tatum, Horford, Marcus Morris, Marcus Smart, and Semi Ojeleye all try and guard LeBron at certain points in this series. The Pacers and Raptors did not have the defensive flexibility to throw multiple different looks at LeBron and handle him in the pick & roll like the Celtics can. The list could go on and on, but in order for the Celtics to have a real shot to take this series, I believe the key factor is Al Horford. I said that the Al Horford vs. Joel Embiid matchup would be the key to the last series. I think Horford’s all around game on both ends of the court was the key factor in why the Celts defeated Philly. Horford was tremendous in the series, averaging 15 PPG, 8.6 RPG, shooting 58% from the field, stuffing the stat sheet with steals and blocks, and even hitting a clutch game winner in game 3 at Philly. The issue now is that Average Al hasn’t exactly had a lot of success against LeBron James and the Cavs in their past playoff matchups. Horford’s all-time record against LeBron and the Cavs in the playoffs is 1-14 over 4 series. A frightening stat – I know. Now I will say that his only win against LeBron and crew came with the Celtics last year. The rest of his putrid history came with the Atlanta Hawks… not exactly a historic franchise. But for those who didn’t pay attention last year, Al was horrible against Cleveland. He averaged 12 PPG, shot 45% from the field, 66% from the line, and averaged a measly 4 rebounds. Meanwhile his counterpart on the Cavs, Kevin Love, ate Horford alive averaging over 20 PPG, 10 RPG… and making 23 three pointers in the 5 game series. If Love dominates the Celtics/Horford again, this series will be over in a hurry. For the Celtics to have a chance to win, they’ll need Al to win his head to head matchup with Love. He may need to have the best defensive playoff series of his career, for the Celtics to advance to the Finals. Defending Love in the post and more importantly at the 3 point line will be his main task as a defender, but he will also be trying to slow down LeBron at times. The Cavaliers have been relentless at using Love to set picks for sniper Kyle Korver. Their goal is to try and get a switch for Love to post-up whatever guard is covering Korver or to get Korver a good look from 3 point range. This will mean that Horford will either need to quickly switch onto Korver (to make sure he isn’t killing the Celtics with 3s), or give a quick hedge to Korver (so he doesn’t have a wide open 3 look) and then get back to guard Love so he doesn’t ge to post up a Celtics guard. On the offensive end, Horford will have to continue to be the post presence he was against the Bucks and 76ers. I honestly think this is the most we’ve ever seen him post up, as a Celtic, during this playoff run. It’s been extremely successful to this point. Kevin Love can struggle defensively at times. Horford needs to take advantage of his strength against Love whenever he gets the opportunity. If Al Horford can win his match-up against Love on both ends of the floor, then the Celtics have a real chance to take this series. As I’ve pointed out before though, he’s clearly had his struggles against LeBron, Love, and Cleveland. I don’t think it’s a coincidence that his teams have struggled as a whole as well. With all this being said, I think Al is going to step up big time. He’s been a man on a mission during these playoffs. He intends to prove he’s worth the max contract he received 2 summers ago. His stellar play will continue and turn this into a 7 game series that could go either way. Buckle up Celtics fans. It’s going to be a roller coaster ride against LeBron! The first round of the NFL Draft takes place Thursday night, beginning at 8 P.M. Rounds 2 and 3 are on Friday night, followed by rounds 4-7 on Saturday. ESPN, Fox, and NFL Network will all carry coverage. I can’t remember an NFL Draft with so much uncertainty. We still don’t know who the Browns are taking at #1. There are potentially 4 QBs who could go in the top 5. The amount of buzz among teams trying to trade up or down feels like it’s at an all-time high… in large part due to the fact there could be up to SIX quarterbacks taken in the first round. There’s a lot of anticipation among NFL fans. Everyone is waiting to see what will unfold over these 3 days. 1.What will the Patriots do with their picks? The Patriots hold 2 first round picks and 2 second round picks. This is arguably their most important draft in the last 20 years and could determine the direction of the franchise after the Tom Brady era. There are 2 sides to look at from a Patriots’ perspective. On one side Tom Brady’s window is closing, no one will deny that anymore. There are numerous holes that need to be filled to put him in the best position to win over the next couple of years. They need a left tackle to replace Nate Solder, a pass rusher, help at linebacker, a tight end, wide receiver, running back, and yes a QB which leads me to my next point. While they have to worry about maximizing Tom Brady’s window to try and win another Super Bowl or two, the flip side is that they need to start preparing for a future without TB12. If there’s a QB they really like, do they try and trade up for him in the first round or take one with one of their first round picks? If they do that, then they’re sacrificing the opportunity to quickly build a better team around Tom for the upcoming year. 2. What will the Browns do with their 1st and 4th overall picks? The Browns are 1-31 over the last 2 years. They last made the playoffs back in 2002. In other words, they’ve pretty much been the laughing stock of the NFL for the last 10 years or so. I have a great aunt who’s 90 years old and has had Browns season tickets for years. Every time we get together for Thanksgiving and Christmas, I hear her displeasure with the Browns ownership, Johnny Manziel, and the franchise as a whole (for all their mistakes). Iris if you’re reading this, I hope this is the year. You’re draft rich with the 1st and 4th picks. You finally have the chance to evaluate and take the true QB of your future. You can also take a generational RB in Saquon Barkley, or an athletic freak like Bradley Chubb to create a dynamic pass rushing force comprised of him and last year’s first round pick, Myles Garrett. Another possibility is to trade one of their picks to a hungry team willing to give Cleveland a promising QB. The options are endless for the Browns and this is their biggest draft in a long time. Finally, led by a new GM who seems to know what he’s doing (John Dorsey), this COULD just finally be the year the Browns start to turn a corner. 3. Where will all the QBs go? Sam Darnold, Josh Rosen, Baker Mayfield, Josh Allen, Lamar Jackson, and Mason Rudolph. All 6 could potentially go in the first round. Darnold, Rosen, Mayfield, and Allen could all be picked in the top 5. The top 4 QB’s have a number of strengths, but on and off the field questions as well – hence we don’t know who’s going to be drafted where. Lamar Jackson is arguably the most explosive player in the draft. There are questions about whether or not he can succeed as an NFL QB but if he ends up in the right place, with a coach and organization that really believes in him, the sky could be the limit. He’s already being compared to Deshaun Watson, who took the NFL by storm last year. Alright so this one is a bit of a joke, but I think it’s funny. 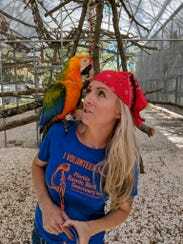 For those who haven’t heard, Zsa Zsa the parrot (pictured above) will be announcing the 4th round pick of the Bucs from the pirate ship in Raymond James Stadium (where the Buccaneers play). Zsa Zsa is only 8 years old and has a life span of 70 to 90 years. I think this is an interesting out-of-the-box PR move, to reveal a team’s NFL draft selection. The NFL Draft is easily the best and most watched of the major sports. Why not put a little spin on it here and there and make it fun? For those of you who don’t know Shaquem Griffin, he was a linebacker at the University of Central Florida. He had his left hand amputated when he was 4 years old due to an amniotic membrane that was wrapped around his hand when he was born. He blew people away at the NFL combine by running a 4.38 40 yard dash and bench pressing 20 Reps of 225 lbs with a prosthetic hand. He’s now projected to be drafted somewhere around the 3rd or 4th round. The NFL has invited him to the draft and to walk the stage to shake Rodger Goodell’s hand when his name gets called. I can’t imagine the emotion that will run through his mind and the extreme pride his family will feel when his name is called. This is truly an incredible story and if you don’t root to see him succeed in the NFL, then why do you even watch sports? Should Patriots fans be a little frustrated with Tom Brady and Rob Gronkowski? Let me preface this by saying I obviously love Tom Brady and Rob Gronkowski as much as anyone. I will be devastated the day Tom retires. If Gronk isn’t wearing a Pats jersey on week 1 next season, I will be absolutely crushed. Bill better not pull a fast one, by trying to trade him at the draft. With that said, I have to be honest – I’m starting to get a little frustrated with TB12 and Gronk’s actions this off-season. Hot take I know – to personally call out everybody’s favorite 2 players on the Pats. I make it a point to stay level headed and non-biased on SportsChatterMJD. For those of you who haven’t been paying attention to Tom and Gronk this offseason, let me get you up to date. Both have been extremely active on social media. It’s at the point where it seems that they’re almost taking subtle shots at head coach Bill Belichick. It all started in February, two days after the Super Bowl, when Malcolm Butler posted a long Instagram defending himself for inaccurate reports about why he didn’t play in the game. He also thanked the Patriots organization. Tom was quick to comment saying, “Love you Malcolm. You are an incredible player and a teammate and friend. Always!!!!!”. Surely Bill couldn’t have been too happy that Tom was quick to chime in on Malcolm’s post. Tom could have just texted or called Butler … if he hadn’t already talked to him. I wasn’t too irked by Tom commenting on the post though, because I think it was genuine. Gronkowski has taken his jabs at Bill as well. For example, he posted the Instagram below for Danny Amendola. He put an emphasis on “Be FREE and Be HAPPY”. I don’t think it was a coincidence that he put such an emphasis on “Be FREE and Be HAPPY”. Multiple reports this off-season indicate that Tom and Gronk are not exactly HAPPY playing under Bill. It seems as if his demanding coaching style has started to take a toll on them. It also became clear that Danny Amendola didn’t love Bill by the end of his tenure with the Pats, per this very eye-opening interview with Mike Reiss that was released over the weekend. I strongly recommend checking it out if you haven’t yet. Is Gronk implying that his “contemplating if he’s going to retire” is more of a power play to try and get a new contract? Gronk wanting a new contract is 100% understandable and warranted. He was only the 4th highest paid tight end last year. Everyone knows he’s the best tight end in the league. He should easily be the highest paid player at his position. The issue is there were reports over the weekend stating that Gronk is skipping the start of the Patriots off-season program (OTAs) because he’s still considering whether to retire before the upcoming 2018 season. If Gronk does indeed retire, it would be catastrophic to the team. If he’s really serious about it, then I hope he’s been extremely transparent with the team because the upcoming NFL Draft on April 26th-28th is probably one of the most critical for the organization in a long time. They need to once again find their QB of the future, a new left tackle, and fill many holes on defense. Losing Gronk to retirement would prioritize the tight end position as one of the top needs for the team. With 5 picks in the top 95, the Pats would have a good chance to address this need if Gronk was indeed retiring. This is why it is imperative that he’s being very transparent about his plans with the team. It’ll be very interesting to see if they use a high pick on a tight end next week. Let’s get back to Brady now because I think he’s the bigger story. ESPN recently reported that TB12 will not be a “regular participant” in the team’s offseason program, even after he returns from his trip to Qatar. The trip was for the “Best Buddies” charity and was his stated reason for originally missing the first few days of OTAs. We know now he’ll be skipping out on the entire first phase. This will be the first time in 8 years Tom is missing the program. He last missed it back in 2008, 2009, and 2010, when he lived in LA. It sounds like there are 2 big reasons he’ll be missing the entirety of the first phase of OTAs. The first is Tom wants to spend more time with his family. We all saw in Tom vs. Time, that his family is an extremely important priority. He seemed pretty beat up in the final episode and Giselle said, “He just wants to go to work and feel appreciated and have fun”. If you’re connecting the dots, this would seem to correlate with a lot of reports over the last few months indicating that Tom felt underappreciated by Bill and is feeling worn out by him. The second reason is that this phase of OTAs is led by the strength and conditioning coaches. Tom will instead workout with none other than his own trainer Alex Guerrero. Everyone knows by now that Guerrero has been the source of the Belichick and Brady tension. It’s not exactly comforting to know that the team’s two best and most important players are going to miss out on the first round of the teams off-season program. I really wonder if Jimmy G was still around, would Tom skip any time? It’s something to ponder… my gut tells me no way. It’s evident that Tom felt threatened by Jimmy G.
The other eye-opening statement in the report from ESPN was the following quote from Jeff Darlington… “I would call it unlikely, at this point, that he is a part of any of the voluntary programs this offseason,” the reporter said Monday. “How far he extends that is a major question, one that I don’t know that even Brady has the answer to.” Some people think he’s implying that Tom won’t be joining the Pats in May and June for the later phases in OTAs. I don’t want to read too much into the statement because I’m not sure Darlington truly knew how that came off to people. If Brady skips out on phase 2 or 3, which are on-field workouts, it’ll be a major red flag with respect to the Brady vs. Bill relationship. Tom has gone on record multiple times over the last 2 years saying he’ll play into his mid 40’s… and maybe even as much as 10 years. If Tom does indeed retire in the next year or so it makes you wonder why he was so adamant about playing for several more years. As a Patriots fan you have to hope that Tom has been transparent as well with Kraft and Bill, telling them how much longer he really has left, so they can continue to plan for the future. Unfortunately I don’t think the drama in the Patriots offseason is over yet. I’m sure we’ll hear more stories and reports in the coming weeks/months. The bottom line is that the Patriots will need their 2 best players to get on the same page as Bill Belichick, sooner rather than later, so they can finally begin to put all this drama behind them. Author sportschattermjdPosted on April 16, 2018 April 18, 2018 Tags bill belichick, Draft, Kraft, NFL, patriots, rob gronkowski, tom bradyLeave a comment on Should Patriots fans be a little frustrated with Tom Brady and Rob Gronkowski?